The broader stock market has enjoyed record highs in the months following November’s election. 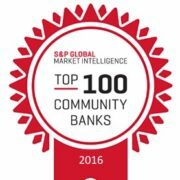 As the markets have enjoyed strong momentum, bank stocks in particular have outperformed. In our view, the favorable run-up in banks is based on two factors: (i) positive sentiments about broader economic performance, and (ii) bank-specific market sentiment. For the broader economy, improved expectations are driven by assumed tax reform, increasing jobs and spending; increased infrastructure spending, likewise bolstering jobs; and general deregulation, expected to improve business operations and economic output. All of these factors are viewed as improving the general economic outlook: and when the economy does well, banks as a group tend to prosper. Furthermore, the market believes an improved economy would lead to higher interest rates, which in turn can result in improved bank profitability. The December 14, 2016 Fed action is viewed as just the beginning by market participants. Additionally, bank-specific deregulation is on the docket, which would further bolster earnings for banks. 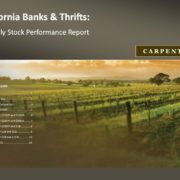 These expectations have caused the market to price in favorable future return expectations for banks moving forward, driving valuations upwards by more than 20% in recent months. This increase in valuation has been experienced across all bank asset sizes. The top performer has been the $1 – $5B range, with the $250 – $500M seeing the least appreciation. Depicted below is the performance of all five indices from November 8, 2016 to January 20, 2017. 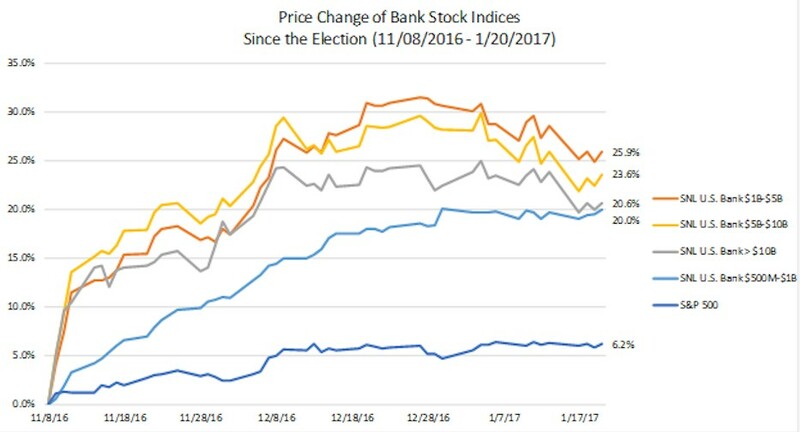 The performance of bank stocks compares favorably with that of the S&P 500 over the same period, which is up only 6.2%. Past performance is no guarantee of future results, but this increase is certainly welcome news to bank investors. Disclaimer: This article is for informational purposes only. This material is not an advertisement. Information presented is for educational purposes only and does not intend to make an offer or solicitation for the sale or purchase of any specific securities, investments, or investment strategies. Investments involve risk and unless otherwise stated, are not guaranteed. Nothing herein should be interpreted as investment advice. Be sure to first consult with a qualified financial adviser and/or tax professional before implementing any strategy discussed herein. Specific companies or securities described in this report are used for illustration purposes only.